Quick Recovery for Linux is an infallible data recovery utility tool that efficiently recovers data from lost, deleted, formatted or inaccessible ext2, ext3 partitions. Software is incorporated with exuberant algorithm that recovers the data effectively. It exceptionally uses the unique Guided File Excavation Technology that helps in location lost/hidden files and folders. It is an easy to use application that is designed with rich graphical user interface. The prudent software works in three different modes such as: Quick Search Mode, Advance Search Mode and Raw Recovery Mode to recover the data. 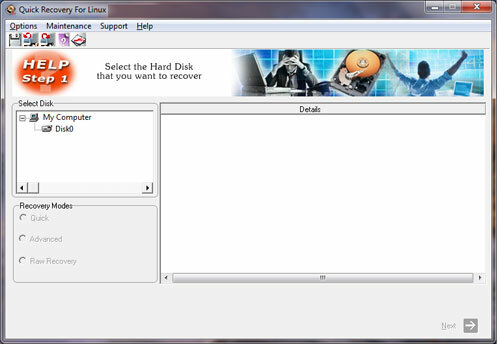 Rich Features of Quick Recovery for Linux Data Recovery Software Ã¢â‚¬Â¢	User interactive, result confound and easy to operate program Ã¢â‚¬Â¢	Quick Recovery for Linux quickly locates partitions and folders Ã¢â‚¬Â¢	Well defined stepwise instructions to recover the data Ã¢â‚¬Â¢	Enables end users to access files if Login password is lost Ã¢â‚¬Â¢	Versatile application provides recovery for inaccessible partition table Ã¢â‚¬Â¢	All the features of this application is read-only, safe to use Ã¢â‚¬Â¢	Allows end users to recover specific files with specific extensions Ã¢â‚¬Â¢	In case where Quick Mode fails to provide required results, Advance search mode can be used Ã¢â‚¬Â¢	If both Quick Recovery mode, Advance recovery modes fails you can use Raw Recovery mode Ã¢â‚¬Â¢	Recovery is possible even if there is corruption of Super Block Ã¢â‚¬Â¢	This software enable the users to recover the data even if LINUX Operating System gets corrupted Ã¢â‚¬Â¢	Data salvage tool supports long file names To run the application you need to install the software first. Once the software gets installed chose desired mode of recovery to recover your data. Once it gets installed chose one of the desired mode to regain your lost data back. For users demo version is available to judge the efficiency and simplicity of the software. Once you get convinced with the software performance you can purchase its full licensed version. This site does not contain serial number, crack, keygen Recover Linux Data serial number : serial number is the simplest type of crack. A serial number(cdkey,product key,etc) is register the program as you may already know. a crack or keygen may contain harmful software. If you cannot find the exact version you want, just give it a try. for more information read .nfo/.txt/.diz file include in zipped file.